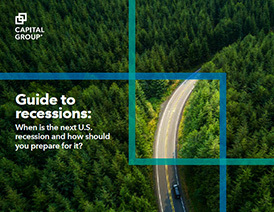 Guide to Recessions | Asset TV U.S.
Capital Group’s latest report, “Guide to recessions,” is a comprehensive e-book that explores where the U.S. is in the current economic cycle and can help advisors answer their clients’ top questions about recessions. There's also an opportunity to earn CE credit after reading the guide. How to determine if a broker-dealer is right for you?